Every part of a grapefruit tree exudes grace. Citrus x paradisi has a generous, giving anatomy, with a use for every part. is exuded by the fruit. It also captures the essential grape like clustering of the fruits as they grow on the tree's branches. But otherwise, the name conveys an inaccurate impression of the distinctions between the grapefruit tree and the grape vine. An anatomical tour reveals the distinctive parts of this enticing fruit tree. The grapefruit tree has an attractively reddish brown bark whose surface is marked by long ridges. It may reach a mature height of 15 to 20 feet (4.5 to 6 meters) in home gardens. In commercial orchards, it tends to reach a mature height of 22 to 30 feet (7 to 10 meters). But because a tree never stops growing, grapefruit trees that are allowed to age in the landscape may reach ripe, old heights of 45-50 feet (13.7 to 15.24 meters). In terms of form, the tree has a slender trunk and branches in youth. For example, a young tree may have a trunk that is around 6 inches (15 centimeters) in width. It tends to keep its basic, graceful form without the need for pruning by its cultivator. But the oldest grapefruit trees may have trunks 8 to 10 feet (2.4 to 3.048 meters) wide. They also may require some removal of dead or dying branches, which always should be done in spring. In terms of shape, the grapefruit tree has a rounded top of spreading branches. The twigs on the branches grow short, supple thorns. This is in line with Citrus genus members tending to have spiny shoots. It also is a characteristic that is more pronounced in grapefruit trees grown from seed and less so in those grown from budded rootstock. The grapefruit is a subtropical, evergreen tree whose leaves tend to stay on their branches two years before dropping. Grapefruit leaves always are dark green on the upper surfaces and lighter beneath. Their margins are broken by many extremely minute, rounded teeth. Grapefruit leaves may grow to a mature length of 3 to 6 inches (7.5 to 15 centimeters) and width of 1-3/4 to 3 inches (4.5 to 7.5 centimeters). Leaves are dotted with pellucid (Latin: per, "through" + lucere, "shine") glands, which are tiny glands full of the oil that is responsible for the plant’s distinctive leafy aroma. "Citrus x paradisi (Macfad.) Pompelino Grapefruit"
The grapefruit tree's leaves are attached to petioles (Latin: petiolus, "little foot"), which are the stretch of stalk at one end of which is the leaf and at the other end is the plant stem. The petioles have wings, which are a fleshy protective layer. Grapefruit wings are either obovate, in which they are attached to the narrow end of a gently oval, egg-shaped leaf, or oblanceolate, in which they are attached to the narrow end of a tapering leaf that is bluntly broadest around the middle. The spring-blooming grapefruit flower may be born singly or in clusters. It is a bright, clean, clear white. Flowers may range in size from 1-3/4 to 2 inches (4.5 to 5 centimeters) across. The grapefruit tree's flowers have four petals, which are unexpected in terms of the generally five petalled citrus flower. But as the photo indicates, every once in a while the grapefruit tree remembers its citrus heritage and actually produces a quirky flower with five petals. The grapefruit flower is described as complete. This means that it contains all of the parts necessary in order to self-fertilize by cross-pollination. Nevertheless, bees are attracted to the flower's generally ample supply of pollen and therefore help in the grapefruit pollination process. The fruit of the grapefruit tree grows in clusters that some find reminiscent of grapes. Generally, the fruits form into groups of 10 to 20 on a branch. Each fruit is generally round. 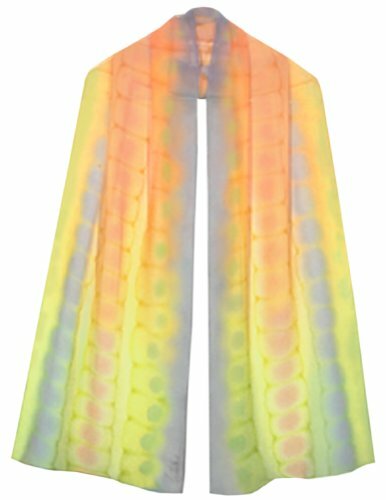 It measures 4 to 6 inches (10 to 15 centimeters) in width. It may weigh 1 to 5 pounds (0.45 to 2.27 kilograms). The pericarp or peel offers a smooth surface over which many fine dots can be seen. It can be as much as 3/8 inch (1 centimeter) thick. It generally is pale lemon in color although it sometimes is blushed with pink. The outer surface, which contains essential oils and is called skin, rind, flavedo or epicarp, is aromatic. The spongy, thick, white inner surface is called the albedo or mesocarp. 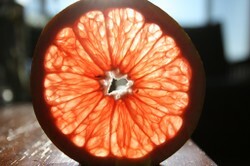 The actual fruit may be solid or have a semi-hollow center. The pulp may be whitish, pale yellow, pink or deep red, the latter color of which is due to the presence of the pigments beta-carotene and lycopene. It is divided into 11 to 14 segments with thin membranous, somewhat bitter-tasting walls that are known as the endocarp. Its juicy flavor, which comes from potassium salt, ranges from somewhat to sweetly acid when fully ripe. seedless if each one has a range of 0-6 seeds within the pulp. Seedlessness points to the presence of little viable pollen and few or no fertile ovules. In contrast, the presence of viable pollen and fertile ovules may result in the production of as many as 90 seeds within one grapefruit. Either way, the seeds are white in color, elliptically pointed in shape and about one-half inch (1.25 centimeters) in length. Unlike its suspected parent pomelo, the grapefruit produces seeds from each of which two seedlings sprout. That can be a lot of seeds when one considers the average fruit-bearing capabilities of grapefruit trees. Generally, a grapefruit tree can be counted on to produce at its lowest range of productivity at least 25 pounds (11.33 kilograms) worth of fruit in the home orchard and 275 pounds (125 kilograms) in the commercial orchard each year. At its uppermost productivity range, one grapefruit tree may yield as much as 250 pounds (113.39 kilograms) worth of fruit in the home orchard and 1,500 pounds (680 kilograms) in the commercial orchard each year. A chance seedling, c. 1860, 'Marsh Seedless' was propagated 1886-7 by Edward H. Tison (Lakeland Nursery), self-named by Charles M. Mason as nursery's new owner. Ackart, Robert. Fruits in Cooking. New York: Macmillan Publishing Co., Inc., 1973. Better Homes and Gardens. So Good with Fruit. Meredith Publishing Company, 1967. Chandonnet, Ann. The Complete Fruit Cookbook. San Francisco: 101 Productions, 1972. Citrus. Edison, New Jersey: Chartwell Books, Inc., 1992, 1997. Dixon, Pamela. New Ways with Fresh Fruit & Vegetables. London and Boston: Faber and Faber Limited, 1973, 1981. Hodgson, Moira. Cooking with Fruits and Nuts. Indianapolis and New York: The Bobbs-Merrill Company, Inc., 1973. Kilmer, Joyce. Trees and Other Poems. New York: George H. Doran Company, 1914. Plagemann, Catherine. Fine Preserving. New York: Simon and Schuster, 1967. Raddin, Charles S. "Grape Fruit." William Kerr Higley, ed. Birds and Nature in Natural Colors: A Monthly Serial. Forty Illustrations by Color Photography, A Guide in the Study of Nature. Volume XV, No. 2 (February 1904): 86-87. Chicago: A.W. Mumford, 1904. Rubin, Cynthia & Jerome. The New Fruit Cookbook. Chicago: Henry Regnery Company, 1974, 1977. Small, Ernest. Top 100 Food Plants. Ottawa: National Research Council of Canada, 2009. The Editors of Time-Life Books. Fruits. 1983. Turner, R. Elaine and Gail C. Rampersaud. “Using Medications Safely: Interactions Between Grapefruit Juice and Prescription Drugs.” Gainesville: University of Florida IFAS Extension Publication #FSHN02-5, 2009. Waters, Alice and the Cooks of Chez Panisse in collaboration with Alan Tangren and Fritz Streiff. Chez Panisse Fruit. HarperCollins Publishers Inc., 2002. 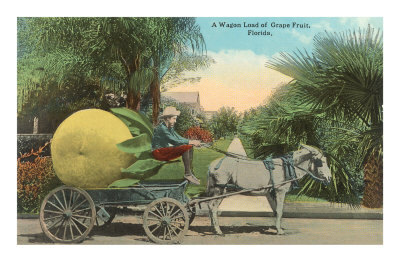 Print from vintage postcard of "A Wagon Load of Grape Fruit, Florida"
Giclée print: vivid image with maximum color accuracy and exceptional resolution; the standard for museums and galleries around the world. AbbyFitz, Me, too, I love the shade and road screens provided by grapefruit trees. Your visit is appreciated, especially since grapefruits are not your cup of tea! Even though I don't care for grapefruit, I love the trees in our yard. They're shady, and they make a good screen from the road.